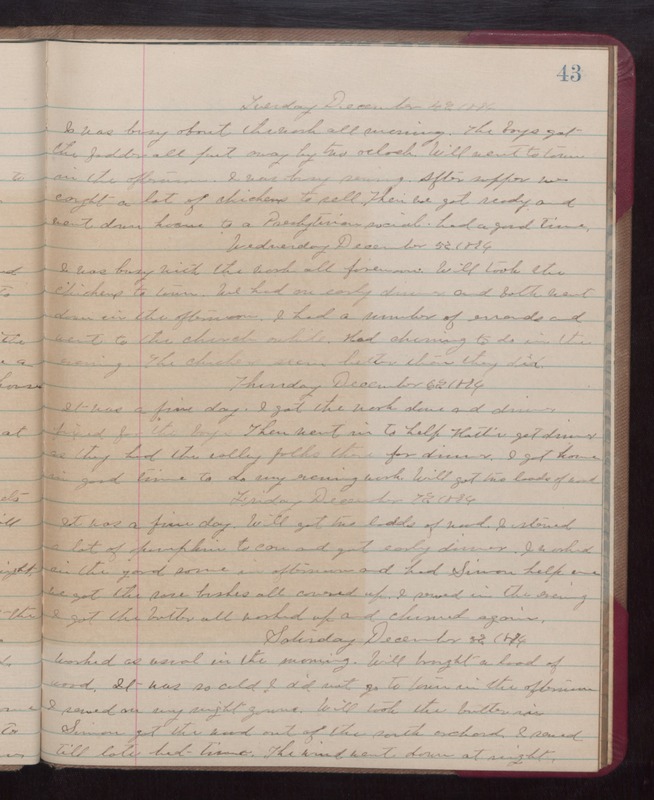 Tuesday December 4th 1894 I was busy about the work all forenoon. The boys got the fodder all put away by two oclock. Will went to town in the afternoon. I was busy sewing. After supper we caught a lot of chickens to sell. Then we got ready and went down home to a Presbyterian social, had a good time. Wednesday December 5th 1894. I was busy with the work all forenoon. Will took the chickens to town. We had an early dinner and both went down in the afternoon. I had a number of errands and went to the church awhile. Had churning to do in the evening. The chickens seem better than they did. Thursday December 6th 1894 It was a fine day. I got the work done and dinner fixed for the boys. Then went in to help Hattie get dinner as they had the valley folks there for dinner. I got home in good time to do my eveining work. Will got two loads of wood. Friday December 7th 1894. It was a fine day. Will got two loads of wood. I stored a lot of pumpkin to can and got early dinner. I worked in the yard some in afternoon and had Simon help me We got the rose bushes all covered up. I sewed in the evening. I got the butter all worked up and churned again. Saturday December 8th 1894 Worked as usual in the morning. Will brought a load of wood. It was so cold I did not go to town in the afternoon. I sewed on my night gown. Will took the butter in. Simon got the wood out of the south orchard. I sewed till late bed time. The wind went down at night.